When I wear the La Sportiva TX4 Mid Gore-TEX boots, even with the sturdy footbeds I use to support my arches, I feel a little as if I am walking on air. They are much lighter than all the other hiking boots I've ever worn, and while I detect nearly every root, rock and bump in the path, the midsole cushions my feet well. A 2015 article on Backpacker.com cites a US Army Research Institute study that found that "one pound on your feet equals five on your back." My personal experience is in line with this equation, and that is why I particularly enjoy the TX4s. There are several design iterations in the Sportiva TX approach shoe family, from the TX2 up to the TX5. Basically the higher the number, the sturdier and heavier the shoe or boot is going to be. For example, the TX2 model is a super lightweight approach shoe that carries well on a harness, while the TX5 is a high-cut leather boot intended for backpacking, though it's still quite light (18.6 oz./527g). There are two versions of the TX4—a shoe and a mid-top. 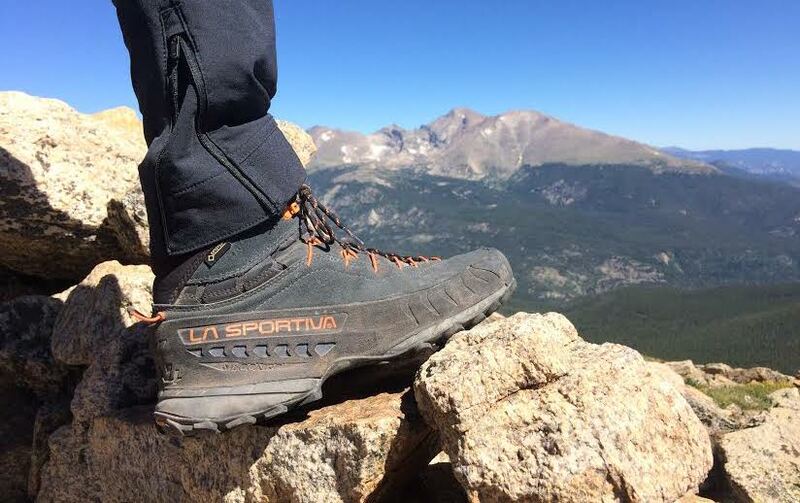 The La Sportiva website describes the latter version as "a mid-cut, leather, waterproof, access boot designed to excel in tricky, technical terrain." I'd say they live up to that classification. The combination of lightness (16.2 oz./480g), sensitivity and sticky Vibram rubber makes the TX4 Mids great for scrambling and even for some aid climbing, particularly if you are frequently stepping into and out of the stirrups for sections of free climbing. If you plan to be standing in your etriers most of the time, however, you might be better off with a shoe that has a stiffer midsole, because the TX4 is soft enough that they don't protect your feet from the pinch of the slings as well as stiffer shoes do. The waterproof qualities of the mid-top boot make them a good choice for summer alpine scrambles, during which it's common to wade through patches of soft snow or boggy terrain. I would not want to wear these for significant snow crossings without some extra form of traction such as microspikes; the soft boots simply don't work well for kicking steps and the round lugs on the sole are designed more for rock than snow. I picked out these mid-top shoes because I wanted something that offered technical performance as well as ankle support. The TX4 Mids have not quite given me the support I was hoping for, and I found that a low-top pair of approach shoes with a heavier and stiffer construction provided a more supportive foundation around my foot than the more minimalist TX4. If you have strong, healthy feet, the TX4 can be a solid choice, though. I broke my right ankle in 2015 and then broke my left foot last autumn, so my feet are weaker and more sensitive than they've ever been. I didn't dare venture out on longer hikes in the TX4s until about two months ago, when I felt that my feet were finally strong enough to handle it. I've now logged a few days of 10 miles or more with the TX4 Mids in the high country over the last few weeks, and my feet are doing just fine. The boots are holding up well, too. One other small complaint I have with the boots is that the very thin laces are harder to keep cinched down tight when I want a snug fit. I suppose I can always replace these laces with a different pair, however, which I may very well do because I intend to keep wearing these nice, light boots. Derek Franz is the digital editor for Alpinist.com. The story of how he broke his foot last October can be found in a feature in Alpinist 61 titled "Glimmers in the Dark."